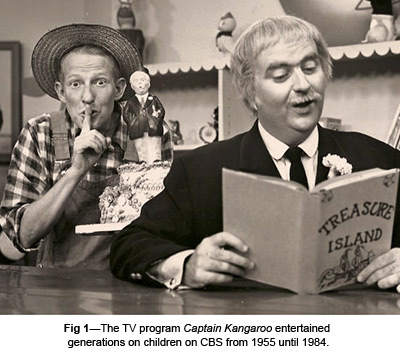 1962: I was six, at my grandmother's house, eating pancakes and watching my favorite show on TV. Captain Kangaroo was talking to Mr. Moose about something not quite visible just off the right side of the screen. My grandmother entered the room. She looked at the big console television, tilted her head, and then tweaked the horizontal-position knob. The image shifted a bit to the left, revealing more at the right side. I sat in awe, jaw dropped, gaze transfixed. When she left the room, I was all over that knob. If you turned it far enough, what would happen? Could you see off the edges of the set? Could you see the cameraman? Could you see yourself? My brain exploded with questions. 1972: I landed a summer job fixing TVs at the local Magnavox dealer. At night, I compared notes with my good friend Glen Collier, who was studying ham radio. Between the two of us, we came to a pretty good understanding of electronics. On the kind of brilliant Saturday afternoon when normal boys should be out-of-doors, Glen and I reversed the connections on the horizontal deflector coil of the new color TV in his family's living room, thus reversing the picture image, left to right. I still laugh when I recall the look on his mom's face, watching the news that evening, taking off her glasses and cleaning them, and putting them back on, vaguely aware that something was wrong with the TV but not sure what. 1982: Professor Martin Graham adopted me as his student. Marty was a rascal and a true genius. He spent the next 10 years passing along his understanding of high-speed electronics and computer architecture. Finding a mentor is one of the best career moves a young engineer can make. I know it sounds quaint, when YouTube and wiki-this and wiki-that can tell you everything you need to know in a minute, but a mentor fills the gap between knowledge and understanding, inspires you to learn more on your own, and opens doors that you never imagined existed. 1992: My experience in analog electronics, digital circuitry, and digital image processing led me to projects in voice mail, robotics, data transmission, video, and Ethernet. Each project taught me new lessons about ringing, crosstalk, ground bounce, and power system design—lessons I began communicating through my writings and public lectures. That kind of communication creates a whirling vortex of information. The more you communicate, the more people want to talk with you about their difficulties, and the more you learn. 2002: Ten years into the seminar business, I had gotten to know a lot of engineers. The successful ones all have something in common: They think of their career as a system, with inputs and outputs, and arrange the inputs to drive their career in the direction they want it to go. They realize that the more people you know, and the more varied your experience, the better your chances of landing a peach assignment (or surviving a major downturn). Therefore, they pick projects that introduce them to lots of other people and teach them new skills. They seek inspiration. 2012: Having lectured to 12,000 students in seminars all over the world, sold some 100,000 books, built up a program of high-speed digital engineering short courses at Oxford University, raised two wonderful daughters, and had the great pleasure of hearing from engineers like you the technical minutia of thousands of design issues, I began planning the end of my seminar business, and this, my last article for EDN. I do not know what the next phase of life will bring, but you can be sure that whenever some new electronic development comes forward, you will find me sitting in front of it, transfixed, gazing with the wonder of a small child. ©2012 Signal Consulting, Inc. and Dr. Howard Johnson. All rights reserved.